Being a bit more organised and checking various things before you travel can ensure you have a good start to your trip. Here are some of the essential things you should do before you travel. You’ll also find a downloadable and printable checklist towards the end. The day before you travel check your flight times and also the terminal that you’ll be flying from. Check this again the day you travel in case there are any delays, cancellations or changes. You can often do this on the airport or airline website. 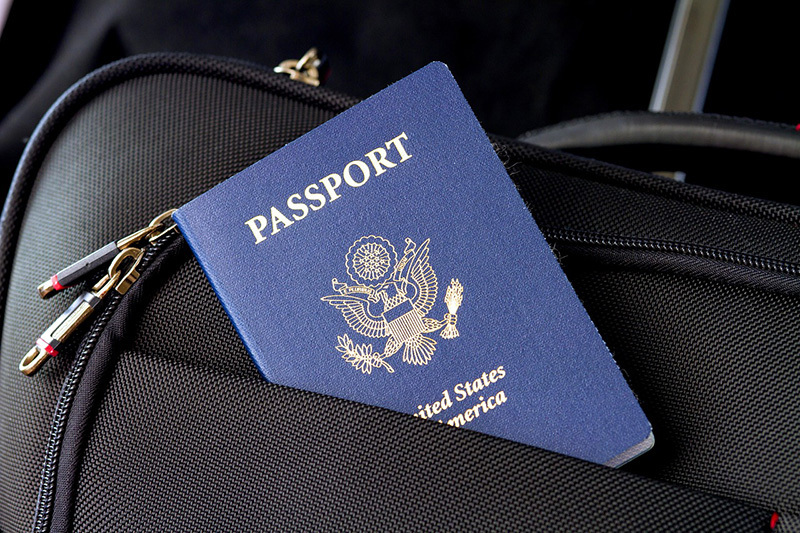 It may sound obvious to check you have your passport and that it’s correct, but I once went on a group trip and one of my friends had his old expired passport. He then realised at the airport the passport he had was missing a corner (which is what they do in the UK). So he then had to pay to change his flight and go home and get his new passport, which was in the same draw. So before you travel always check your passport is correct and valid for travel. Checking the visa/entry requirements for your destination is something you should check well in advance, but it doesn’t hurt to double check. I once made this mistake when travelling to Canada from the UK, where Canada border control had recently introduced a new requirement for an eTA (advance authorisation). I then got to Gatwick Airport and had to log into the eTA website and get this authorisation before I could travel. Luckily this could be done online and was quick, I also had plenty of time before the flight and finally the airport staff were helpful. But this was a learning experience for me and was stress that could have been avoided. If you are a UK citizen then head to gov.uk/foreign-travel-advice to check entry requirements for your destination. 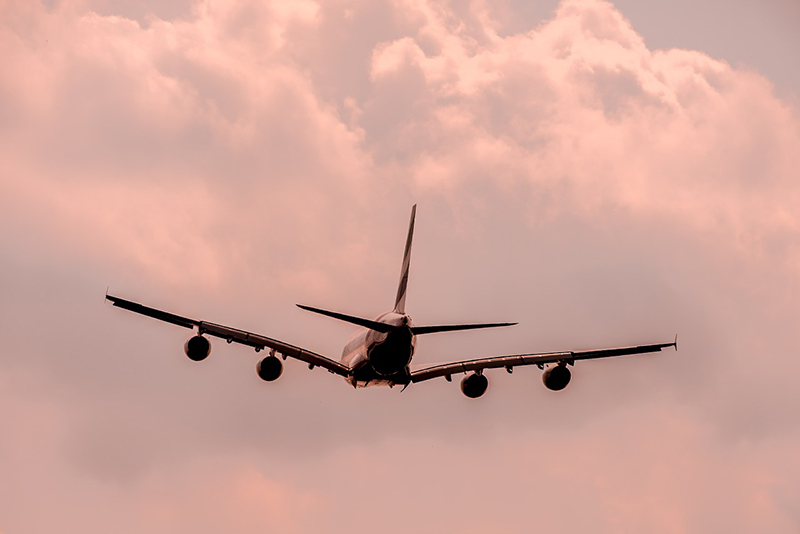 Ensuring you have valid travel insurance is important and not just for your own safety, but sometimes border control may ask for evidence you have it. Luckily in many places it’s extremely easy to buy insurance online and sometimes even airlines offer this when booking. 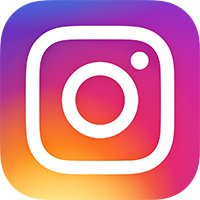 As well as insurance you should also ensure you have any other important documents, such as proof of your accommodation and itinerary etc (depending on what your destination requires). 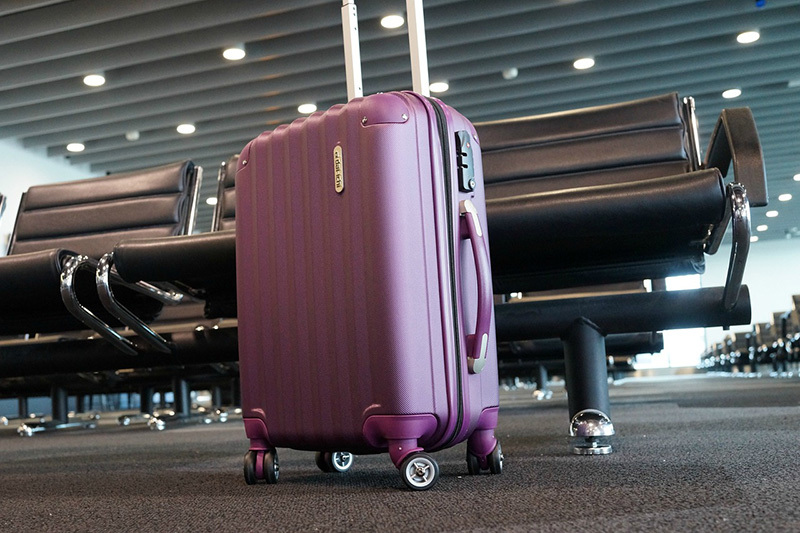 Excessive baggage fees are always avoidable by being prepared and checking your allowance in advance. To do this make sure you have checked your allowance, which is often on your booking and sometimes printed on your ticket. 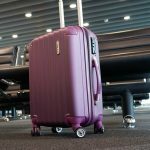 If you do need extra luggage then buy before you arrive at the airport as it can often be cheaper. Ensure you’ve packed any essential items that you may need before you travel. This would be items you’d not easily find once you arrive at your destination. I would class essential items as travel adaptors, toothbrush and toothpaste, maybe a hair straightener, underwear etc. Of course, the list of essential items will vary from person to person so it’s worth having a separate list of your own for this. 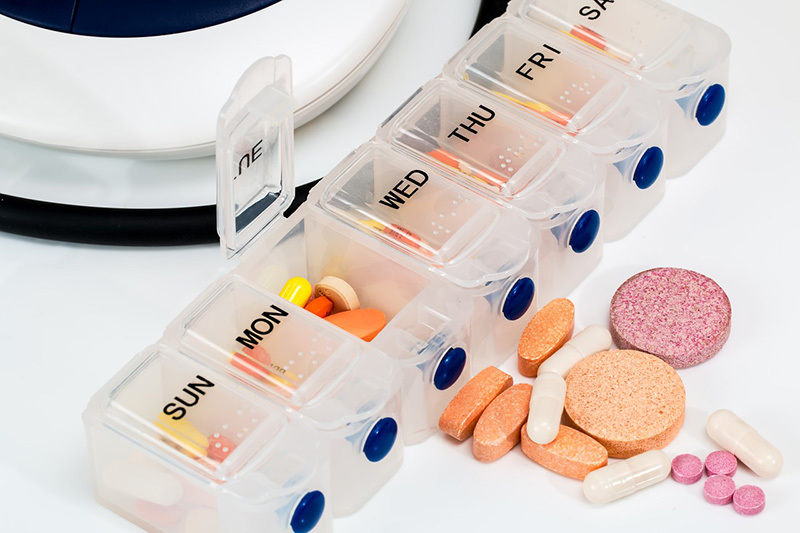 Travelling and realising you’ve forgotten important medication can be extremely stressful, and if you don’t have time to go home and get it you may even have to cancel or reschedule your flight. Before you travel check all your essential electronics such as your phone is charged, or that you have a power bank/portable charger . Arriving at your destination and your phone battery being flat can be a total pain. You may have your hotel or other details on there, or need your phone for other important reasons. Finally make sure you have all the entertainment you need for the plane, train, or bus, such as headphones, downloaded music or movies, updated your Kindle etc. By doing this you might find that your time will fly while your travelling. 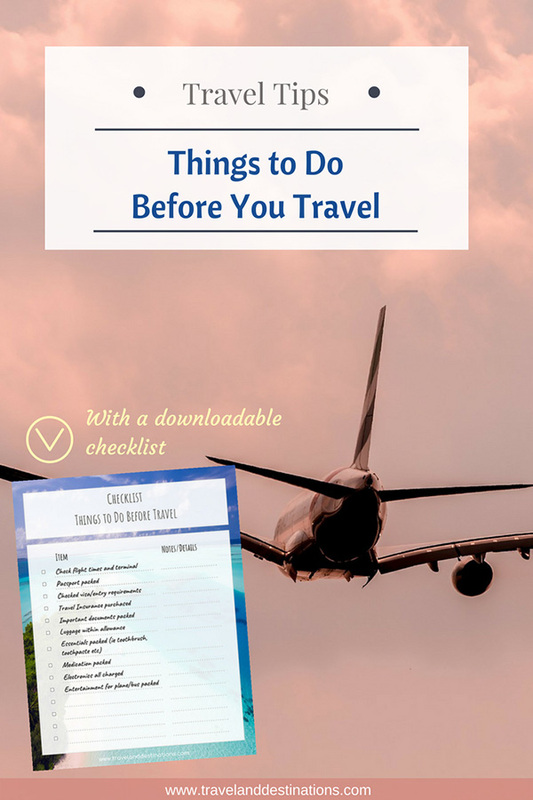 Here is a checklist that you can download and print for when you travel. As well as the main items you’ll find space to add some extras. The “NOTES/DETAILS” bit allows you to add extra information such as flight times, the terminal, luggage allowance etc. Hey Buddy!, I found this information for you: "Important Things to Do Before You Travel (With a Downloadable Checklist)". 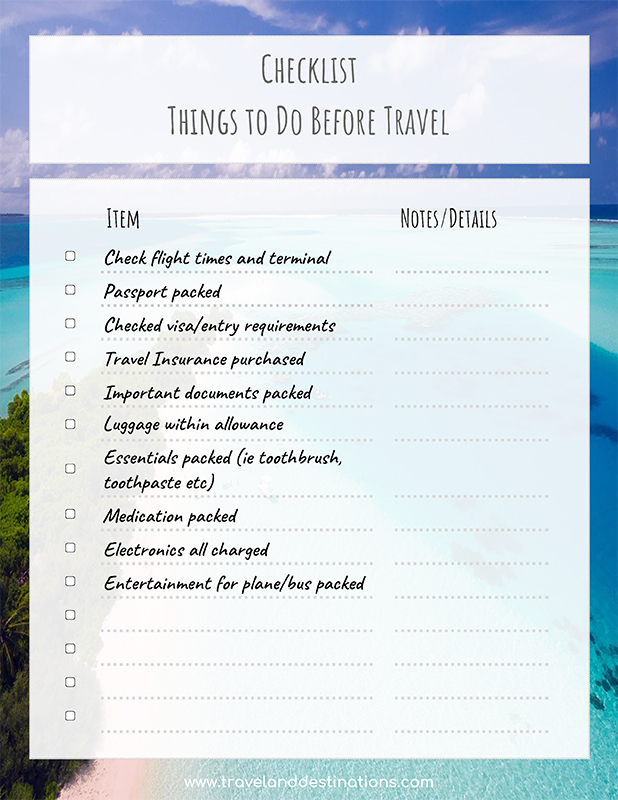 Here is the website link: https://www.travelanddestinations.com/things-to-do-before-you-travel-downloadable-checklist/. Thank you.